The "Sun Bay" offers a total of 80 km of magnificent trails of varying difficulty. Difficulty: average Total distance: 15.970 km Altitude min: 9 a.s.l. Height max: 333 a.s.l. Altitude start: 9 a.s.l. Height arrival: 9 meters above sea level. Start from Piazza San Francesco. The first part of this route is paved until it reaches the small church of Santa Croce. From here we continue on Via Julia Augusta, an ancient Roman road that retains its original cobblestones and a few Roman tombs and ruins. The end of Via Julia reaches the town of Albenga and from here, a paved ascent path turns into "Sentiero dell'Onda" or "Path of Waves", which can be considered one of the most beautiful hiking trails in Liguria, with spectacular views. Finally, a short paved road leads to a typical Ligurian "mulattiera" or mule track, from where you come back to the starting point. Level of difficulty: high Total distance: 14,520 km Altitude min: 34 a.s.l. Height max: 507 a.s.l. Height start: 57 m above sea level. Height of arrival: 156 meters above sea level. Start from the square in the hamlet of Solva The first part of this route follows the paved road from Solva to the nearby neighborhood of Cavia and ends at the sanctuary of Madonna della Guardia. From here we continue in a simple, slightly steep one-way with a wonderful panoramic view. Finally, a short, but uphill, unpaved path leads to the "Sentiero del Sole" or the path of the sun, which offers a spectacular view over the sea. This trail will eventually take you back to the main road between Solva and Cavia, and after a short climb, continue downhill on an old mule track that will take you back to Solva. Difficulty level: high Total distance: 9,520 km Altitude min: 183 a.s.l. Height max: 595 a.s.l. Altitude start: 185 meters above sea level Height of arrival: 183 a.s.l. Start from Piazza Merlini in the hamlet of Moglio The route starts with a combination of asphalt, cement and unpaved ground that leads to the "Torre di Adelasia", an old tower in the hamlet of Vegliasco. From here you can take a single track slightly uphill and finally an unpaved track all the way to the top of Pisciavino (600 mt. Above sea level). The tedious training to reach this point is worth the breathtaking view it offers. From here, the route goes downhill through a series of paths, sometimes more difficult, to the starting point in Moglio. Start of Palazzetto dello Sport (Alassio sports hall) The first part of this route is steep and paved until it leads to a dirt track that ends at the old Cazulini tower. From here you can continue on a single track in the direction of the small hamlet of Moglio and later on a path that is partially paved and partly a steep mule track to the crossroads in front of the sanctuary Madonna della Guardia. Now the path descends slightly to the point "Crocetta" (defined by the restaurant of the same name) and after a paved path, take a narrow and technical way back to the starting point. Difficulty: high Total distance: 32.640 km Altitude min: 7 a.s.l. Height max: 533 a.s.l. Altitude start: 16 a.s.l. Height of arrival: 16 a.s.l. Start from Piazza Partigiani This itinerary follows the same tour of the famous "Alassio Muretto Gran Fondo". 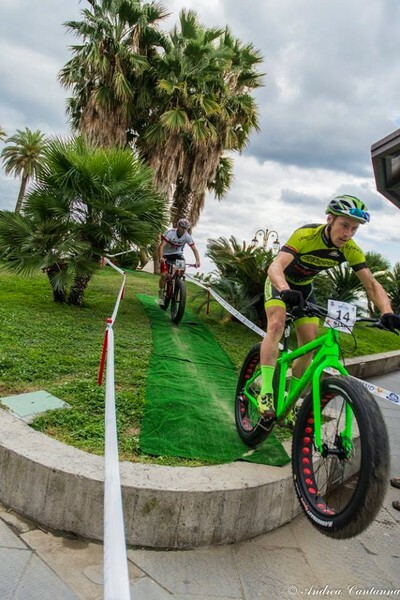 After you have cycled the main roads through the town, go uphill in the direction of the ruins of the church of San Bernardo and right next to the park adventure "Solleone". 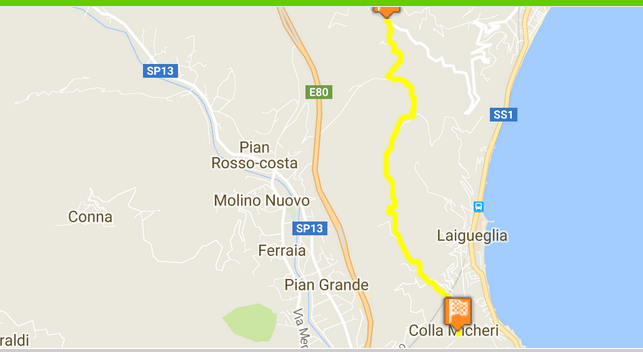 From here you can follow a 10 km loop of hills running over Laigueglia. Once back in the adventure park, you can take the paved road in the direction of Crocetta-Madonna della Guardia and from here a path to the "Torre di Adelasia" in Vegliasco. From the old tower, the tracks start on paved and unpaved ground; some of them are of great technical difficulty, but they overlook the sea and thus have a remarkable view over the wide coast and especially over the characteristic island "Gallinara". Finally, a steep and challenging path leads back to Alassio. Difficulty level: high Total distance: 13,270 km Altitude min: 10 a.s.l. Height max: 335 a.s.l. Altitude start: 15 meters above sea level. Height of arrival: 10 a.s.l. The starting point of this route lies on the beach of Laigueglia, at the "Torrione", which was used for centuries by the soldiers and the citizens to watch over the water and see the "Saraceni" sailing over the sea, to plunder the coastal towns of Liguria. The first part of the route is paved, then it turns into unpaved ground to the hamlet Colla Micheri. From here a single route, sometimes simple and sometimes more challenging, takes you on a tour of the hills above Laigueglia. Difficulty level: high Total distance: 3,940 km Altitude min: 201 . Height max: 285 a.s.l. Height start: 218 a.s.l. Height of arrival: 215 a.s.l. This track presents some simple parts combined with other technically very difficult and is suitable for cross-country racing. The challenging up and down the route are complemented by the magnificent view! Difficulty: low Total distance: 4,700 km Altitude min: 201 a.s.l. Height max: 285 a.s.l. Height start: 285 a.s.l. Height of arrival: 270 meters above sea level. This path is easy, well suited for those with less experience, and it also offers beautiful views over the sea. It starts from the characteristic hamlet of Colla Micheri, located on the hills above Laigueglia. Here an old Roman road meets the "Percorso Verde", which ends at the ruins of the church of San Bernardo. The testimony of the antiquity of this way is a memorial stone, which remembers when Pope Pius VII, on the way back from his exile during the Napoleonic era, came.